Whether you are traditionally published or self-published, giveaways are part of the publicity machine. So I jumped at the chance to review The Busy Author's Guide to Promotional Giveaways, by Dawn Seewer. Because I'm a busy author, right? Who isn't? Note: This new publication is more of pamphlet than a book. It's a short read. But if you're new to the book peddling biz, there's plenty to learn. The first portion of the book scared me into reading further: The Legality of Giveaways. I must admit that it hadn't occurred to me that giving away stuff could get me in trouble with the law. (Authors have enough to fear already, no?) But reading this section was truly a blessing, because it helped frame my thinking around the giveaway styles I see on so many blogs. Part II, Creating Your Campaign wasn't nearly as opinionated as I wished it would be. There are lots of ideas here, from free copies to swag. But it would be nice to know which items worked, and for which book genres. The information here is quite general. The Busy Author's Guide is at its best when reviewing the rules, offering disclaimer language and explaining the lingo associated with the giveaway language we see every day. Lastly, it is further useful that The Busy Author's Guide beats the drum to remind you to always keep the purpose of your giveaway in mind. By not losing sight of the goal, you will surely remember to tie those giveaway entries to new Facebook "likes," to newsletter sign-ups and website visits! 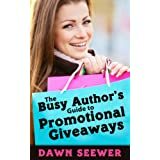 The Busy Author's Guide to Promotional Giveaways, by Dawn Seewer, is available for $0.99.